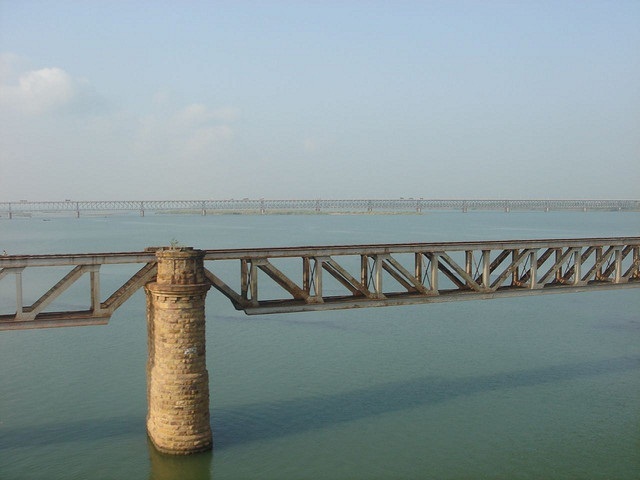 The interlinking of the Krishna and the Godavari rivers took place in Andhra Pradesh today. Chief Minister N Chandrababu Naidu released the water of the Godavari into the Krishna at Ibrahimpatnam village, about 20 km from Vijayawada. After the inauguration ceremony, Naidu addressed farmers during a public gathering at the same venue, where he announced that the state government was committed to assist them. He added that his government was working on a lot of water conservation and groundwater recharge projects. Around 80 TMCs (thousand million cubic feet) of Godavari water flew into the Krishna for diversion to drought-prone areas of the Rayalseema region of the state after being released. The water would be diverted through the Srisailam dam on the Krishna. The Pattiseema lift irrigation project, worth Rs 1,400 crore and responsible for ensuring the diversion of Godavari’s water into the Krishna, was scheduled for completion in early 2016, but was completed before schedule. After the early completion of the said project, the Andhra Pradesh government is reportedly ready to push for the speedy completion of the Polavaram dam project and expects to finish it by early 2018. According to the state’s water resources minister, Devineni Umamaheswara Rao, the place of confluence of the two rivers will be developed into a spiritual as well as tourism centre. According to press reports, the government is also contemplating building a bathing ghat at the place where the river will merge for the Pushkar congregation scheduled for July 2016.